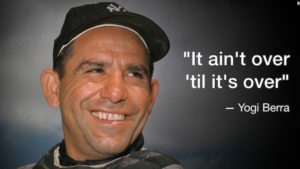 CNN honors Yogi Berra, Yankees’ Hall of Fame catcher, when he dies in 2015. Sales veterans have come to realize that if something can go wrong, it probably will (good ol’ “Murphy’s Law”). That means you should button up the sale, or “buyer’s remorse” may rear its ugly head. Don’t take anything for granted. When the prospect says, “Things are lookin’ good,” don’t believe it! It’s just like, “The check is in the mail.” Yeah, right. The deal isn’t over until you get the check…and it clears. So, what to do? Use the “rehearsal technique.” Once you know the agony of defeat having lost a sale you were sure you won because the customer changed their mind, you’ll realize the importance of rehearsing to prevent the same in the future. It works like this: Explain to the customer what will likely happen with buyer’s remorse and invite them to call you once it sets in. When they do call (assuming you haven’t called them first, which is what you should have done), remind them of the reasons they made the buying decision. Remember, it ain’t over ’til it’s over. 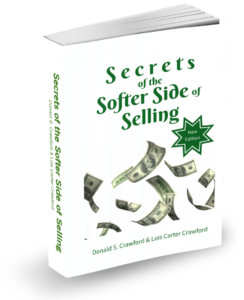 To learn more, see Chapter 14 in Secrets of the Softer Side of Selling. For even more sales help, join our FREE Sales Club! “See” you next week.